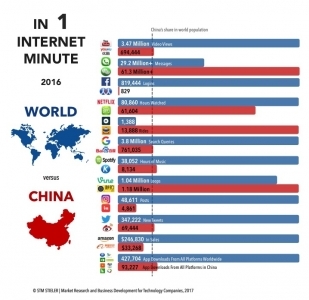 On the occasion of the Chinese New Year 2017, we looked at the twelve most popular applications in the consumer Internet in China and the rest of the world: What happened in 1 Internet minute in 2016? It is widely known that there is a Chinese equivalent for each application in the West - in a broader sense, since user habits differ considerably between the different cultural spaces. The analysis at hand describes, which applications these are, identifies the most important differences, and provides an outlook into the future. Internet use in China comparatively strong, "mobile first"
About 20 percent of the world's population lives in the People's Republic of China. A look at figure 1 underlines the thesis that Internet use in China is higher than the world average. In this area, the country is ahead of most other developing and emerging countries. According to the World Bank and the UN, 721.4 million of the approximately 1.3 billion Chinese in 2016 had access to the Internet. Particularly fascinating about this phenomenon: Depending on the estimate, between 70 and 90 percent of them are "mobile first" - they just skipped the age of the desktop computer and access the Internet primarily (if not solely) by smartphones or tablets. It is not surprising that global (or better, American) companies are most likely to lead the global Internet economy. Amazon started with its global expansion already in 1998 with the step to Germany, and now achieves 37 percent of its sales outside the US (in comparison: Alibaba's international share of revenue is only 4 percent). Google was a global phenomenon right from the start. It has many years of experience with intercultural teams and the coordination of development centers on different continents. Other companies such as Facebook have followed this path. People also watch more clips on Youtube than on Youku, because the Chinese front-end advertising often takes 40 seconds or more. Facebook beats its original Chinese copy RenRen clearly, because Chinese Internet users now prefer to use WeChat (more about that later). Google also has more search queries because its search engine delivers much better results in an international context than its Chinese competitor Baidu. However, the company should not be underestimated: Baidu currently has the most reliable voice recognition software and was awarded as the second most innovative company in the world after Amazon by MIT Technology Review in 2016 . Spotify's biggest Chinese rival is also comparatively small because this market is particularly fragmented in China. While Instagram is established as a platform, WeChat and Weibo in China leave little room for vertical apps like In. When considered in detail, Amazon and Alibaba have different business models: while Amazon generates the bulk of its revenues through products sold on its platform and through its web services, the biggest shares of Alibaba's revenue comes from ads and add-on services for sellers on its platform. In the case of WeChat or the ride hailing app Didi Chuxing, China is ahead of the rest of the world. Although many of the technologies underlying these new companies and business models do not originally come from China, the country is emerging as the global lead market for mobile commerce and sharing economy. This is due to the sheer size of the market (Alibaba alone bought more servers than Brazil in 2015 alone) as well as the density in the Chinese mega- cities. In China, there are 160 cities with more than 1 million inhabitants and 15 of with more than 10 million inhabitants. Didi currently has a market share of almost 90 percent among the Chinese ride hailing apps. According to its own data, the company distributed over 20 million trips a day in October 2016. With its global presence, UBER had 2 million rides per day in July 2016. Mistakenly, WeChat is frequently compared with WhatsApp. However: This application can do much more. For many people in China, an urban life is hardly imaginable without it - an effect that will probably even intensify. Already today, people call taxis, book flights, train tickets and hotel rooms, arrange appointments with the local government and order services such as cleaning services or massages as well as food or flowers. 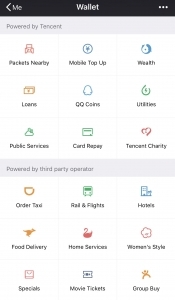 WeChat is also the most convenient way for many Chinese to manage their finances. It is an easy and secure way to pay for online and offline purchases. During the Chinese New Year festival 2016, the platform handled nearly twice as many transactions as Paypal did during the entire previous year. WeChat's latest coup is the introduction of so-called micro-apps, which extends the functionality of the platform again and makes it independent from the respective operating system - a step, in which Apple would banish any smaller provider from the AppStore. Because of the dominant position of WeChat in China, Apple has no choice in this case. This concentration is not necessarily always to the customer's advantage. By the end of January 2017, for example, the Shanghai city government felt compelled to introduce price caps because too many passengers had complained about exorbitant prices. WeChat will probably also play a major role in the virtual point system, with which the Chinese government wants to monitor and evaluate the conformity of its citizens. The strong capital base of Chinese investors and their hunger for foreign technology also led to some spectacular takeovers by Western Internet companies in 2016. Prominent examples include the acquisition of Skyscanner by the leading Chinese online travel booking platform Ctrip (1.74 billion USD) or the takeover of AppLovin, the third-largest platform for mobile advertising after Google and Facebook, by the Chinese investor Orient Honda Capital (1.42 bn USD). We expect this trend to continue in the coming year despite stricter capital controls. The potential gain - the largest single market in the world with a growing urban middle class and an almost non-existent anti-monopoly legislation - makes investors to take the highest risks. Recent examples such as the restructuring of Leshi (the company behind Faraday Future, among others), the telephone manufacturer Cosun's failing bonds, as well as statements from senior executives of leading Chinese Internet companies, prove that many companies need to learn more about how to control their costs, if they want to persist. At the same time, we are expecting more impetus from Chinese Internet companies in Artificial Intelligence during the coming year. Recent acquisitions by Baidu, Alibaba and Tencent direct into to this area. This aspect is further fancied by the fact that Chinese companies are explicitly encouraged by the government to develop applications for artificial intelligence in the industrial sector - areas that have been left out by the major players in the Silicon Valley so far (possibly due to the comparatively small size of the manufacturing sector in the US). The activities shown in Figure 1 will therefore accelerate further in the coming year. Figure 2: The Chinese E-Commerce market - a blueprint for industrial applications? Georg Stieler started our office in Shanghai in 2011 and has been in charge of it since then.